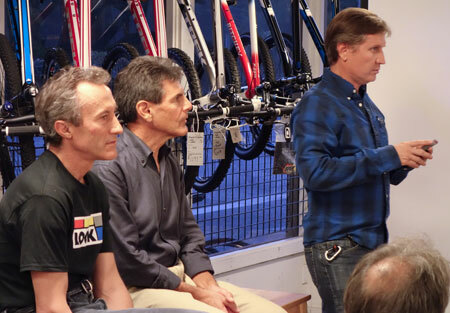 Bicycle Outfitter hosted an evening with RAAM competitors Jonathan Boyer, Michael Secrest, and Chris Kostman. They showed their 1985 duel as recorded by the Wide World of Sports. Bicycle Outfitter arranged for a rare reunion of Race Across America (RAAM) competitors from the 1980s on Tuesday night and those who attended left with a new appreciation for the world’s most difficult bike race. Chris Kostman was 18 when he served as a referee assigned to keep an eye on Jonathan “Jacques” Boyer at the 1985 RAAM. He went on to complete the RAAM and helped officiate for a dozen or so years. He had the pleasure of introducing Boyer, 1985 winner, and 1985 second-place finisher Michael Secrest. Boyer was making a rare visit home to Monterey from Rwanda where he spends most of his time coaching bike racers. Secrest lives in Scottsdale, Arizona. Kostman showed Wide World of Sports excerpts from the 1985 race when Boyer and Secrest battled it out most of the way. I had never seen ABC’s coverage with announcer Jim Lampley. I got tired just watching the riders suffer through the endless hours of riding without sleep. It takes a special dedication to do this race. Secrest finished RAAM five times, won in 1987, and went on to do a solo cross-country ride in 1990 in 7 days 23 hours, a record that still stands. Boyer rode RAAM in 2006 in a category that required 4 hours sleep per day. These guys aren’t young in years, but they look like they could go out and complete RAAM tomorrow. I rode with Boyer and other hard-core racers on a super-hot day back in 2003 through the Santa Cruz Mountains and I don’t think Boyer broke a sweat. Boyer has made a decent living from his professional racing career, as the first American to compete in the Tour de France. He didn’t do RAAM to make money. Quite the opposite. Secrest spent his last dime racing RAAM and going after 24-hour track records. He’s a purist athlete to the core, emphasizing on more than one occasion that he never did drugs, other than the allowed asthma medication. Wide World of Sports stopped following the race after 1986 and since then it has continued in obscurity. Wikipedia has good coverage of the event. If you’re interested in entering, just go to the RAAM website. Average cost – $20,000. On my next 100-mile ride I’ll think about this memorable evening and tell myself 100 miles is a walk in the park compared to RAAM. This entry was posted on September 26, 2012 at 8:18 pm and is filed under News. You can follow any responses to this entry through the RSS 2.0 feed. You can leave a response, or trackback from your own site.